Two Republican presidential contenders are backing a Senate bill that would bypass Baghdad in arming Kurdish militias fighting the Islamic State. Senators Joni Ernst (R-Ia) and Barbara Boxer (D-Ca) have submitted a bill giving the White House emergency authority to provide weapons and training directly to the Kurds, without going through the Iraqi government. Republican presidential candidates Rand Paul of Kentucky and Marco Rubio of Florida are among the bill’s co-sponsors, reports The Hill. South Carolina’s Lindsey Graham, rumored to be considering a presidential run, is a supporter as well. Last week, the House Armed Services Committee adopted a budget proposal that would have allocated almost $180 million to the Kurdish militia, known as the Peshmerga, and asked they be “deemed a country, which would allow these security forces to directly receive assistance” from the US. President of the Iraqi Kurdistan Region, Masoud Barzani, who is visiting Washington this week for meetings with top US officials, said Wednesday that the Kurds’ ultimate goal was an independent state. “I cannot say if it will be in the next year, or when, but certainly the independent Kurdistan is coming,” Barzani said during an event at the Atlantic Council. “We want it to be through peace and dialogue,” he added, not force or violence. “It will take place when the security situation is resolved,” Barzani clarified, referring to the ongoing conflict against the Islamic State. Though both President Obama and Vice President Biden insisted on “a united, federal and democratic Iraq” in their talks with the Kurdish leader, Barzani said the country’s unity should be “voluntary and not compulsory," contingent upon how democratic Iraq was. While the US considers the Kurds an “extremely important” partner and a “natural ally” in the fight against the IS, Washington remains committed to Iraqi unity, US National Security Council spokesman Alistair Baskey told the Kurdish media network Rudaw. So while Washington wanted to be a “good partner” and “hear the needs” of the Kurds, all weapons deliveries will be coordinated through the federal government in Baghdad, he explained. The US has set up a joint operations center in the Kurdish city of Irbil, and is training three Peshmerga units in nearby camps. 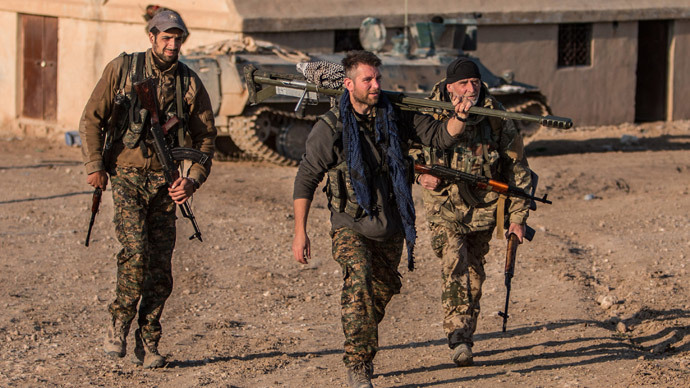 Baskey called US aid to the Kurds “significant and robust,” noting that there have been numerous deliveries of both light and heavy weaponry since last August. “It will result in partitioning of the country, and we are responsible for protecting [its] unity,” but the US “is trying to apply pressure on Iraq,” he added. Former US foreign service employee Peter Mark van Buren added that the decision on the matter may become “inflammatory” if taken now – which is unlikely. “The Kurds were careful to say that once the Islamic State is defeated, they’re going to hold that referendum. And of course, the defeat of the IS can be defined by a number of people in a number of ways. Essentially, what you’ve got is the Kurds arguing for a little more room in terms of their future independence, a little more muscle in their relationship with the US,” van Buren told RT. “These times, apocalyptic statements that the sides make are really part of the negotiating process. The US will have to give a little towards Kurdish independence, as will the Baghdad central government, but I think not much,” he added.